• 1 teaspoon margarine for each crepe. • 2 whole oranges, peeled with a knife so that no peel remains on the orange. Then slice the orange into sections to remove the inner peel. The final product will have no peel, but pure orange meat. Squeeze the juice out of the remaining peels. Pour over the meat of the orange in a bowl and set aside. Whisk flour, eggs, milk and ½ of the sugar. Add spices. This should be a thin, runny batter. Heat a non-stick pan on medium heat. Add a tsp of margarine and once scoop of batter so that you have a nice thin crepe. Cook 2 minutes on each side. It shouldn’t stay in the pan until it is brown. Take out at the yellow stage of cooking. Put on a plate and keep it warm in a low heat oven. Continue until all batter is used. Caramelize sugar in 1 Tbls butter on medium heat. Allow it to get a nice golden color. It will be very easy to burn this, so stay right with it, stirring constantly. Add orange meat and the orange juice. Let it get warm. Add the Grand Marnier. Ignite the alcohol. Let it burn 15-20 seconds. Then put a lid on to extinguish flames. Fold each crepe twice. 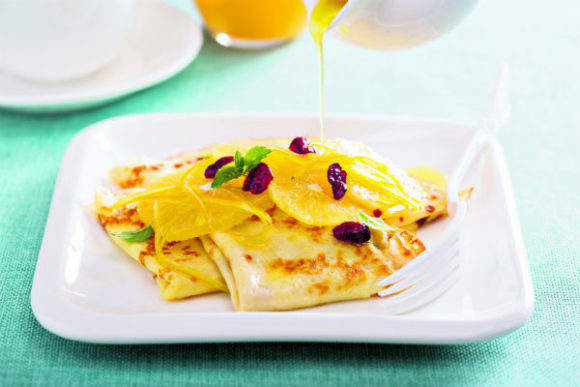 Drizzle the Grand Marnier sauce with the orange meat over each crepe. Add whip cream if desired.